Hey, friends! 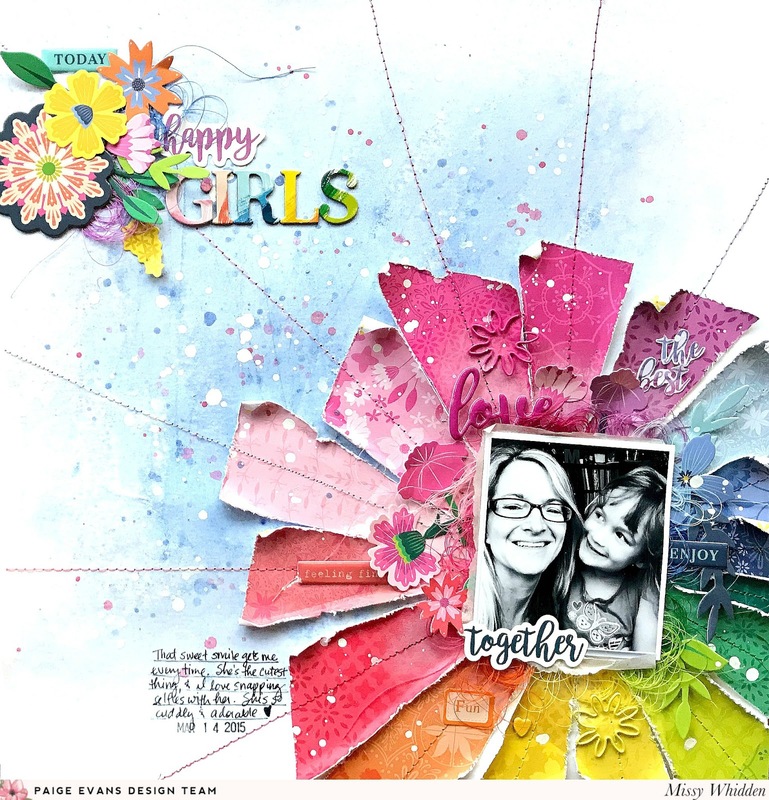 Missy Whidden here with my first layout using Paige’s beautiful new Horizon collection! It is so colorful and bright and my eyes have never been happier. I knew right away that I had to use Paper 03. That rainbow color burst is just too gorgeous. I cut up all the pieces and made a smaller sunburst design in the lower right corner of some white cardstock. I ruffled up the edges of each piece using an edge distresser and layered them a little crooked. 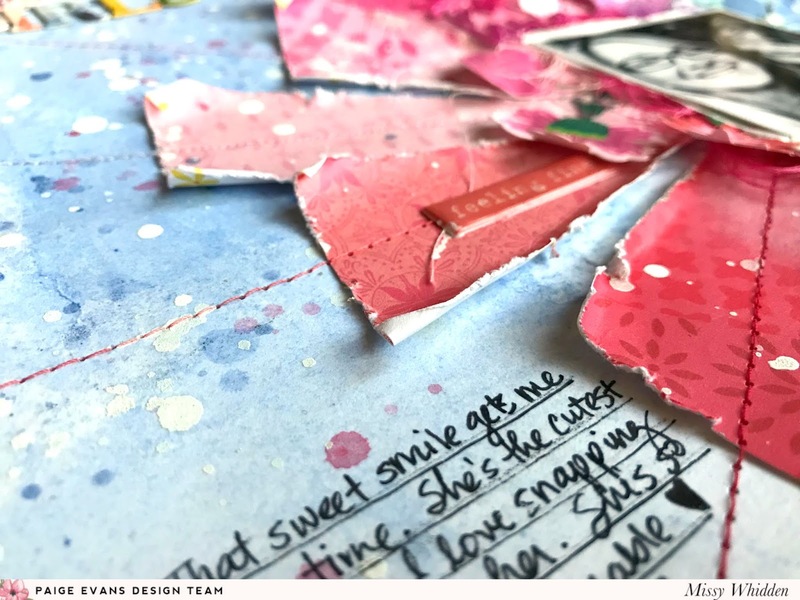 Once I decided on that as my main design element, I added some mixed media to my background. I covered the cardstock with clear gesso and then used some blue ink sprays to create a light blue color wash look. I didn’t use multiple colors on the background since the papers were so bold. I wanted them to stand out. After my background dried, I glued down all the pieces and then machine stitched through each one using matching thread. I sorted through all of the Horizon embellishments and went with a tone-on-tone effect. I used pieces from the Floral Die Cuts, Epoxy Stickers, Stickers, and Chipboard Stickers. 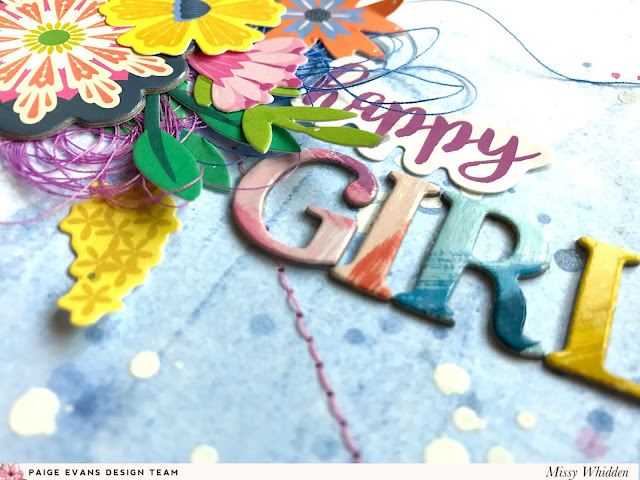 I also used two of the adorable floral Shaped Paper Clips. 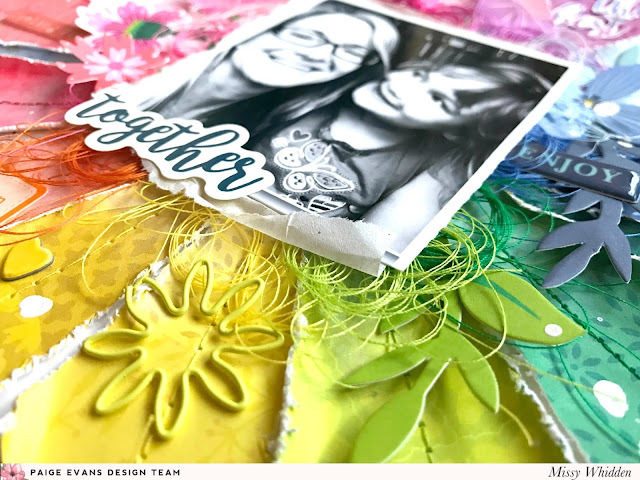 I also used the same colors of thread and created little messy tangled nests of each color around the photo for more texture. I created a small cluster in the upper left area of the background using more of the same embellishments. I love the variety of bright colors! Here’s a look at the background. I wanted it to be more of a soft color so it wouldn’t compete with the sunbursts. I sprayed the ink down, spritzed it with water, and just let the color run. I also added some splatters after it dried using the blue and bit of pink. In the end I decided to add some white splatters, so I watered down white acrylic paint for that. I really love how these sunbursts just pop off the page. Distressing the edges makes such a big difference in the dimension, so I’m happy with how that turned out. I hope this inspires you to use Horizon! Thanks so much for stopping by! This is STUNNING! I loveeeeeeeee the rainbow colors and the stitching!!!! !